Back in January we wrote about First Citizens Bank evicting tenants of a Port Orchard building following a foreclosure. The eviction forced popular restaurant Tommy C’s to relocate, and led to the shuttering of Sk8Town. Another business located in the Piperberry Way building has found a new home in an just down the road. Helen Kestle, owner of Fab U Look makeup and hair salon, reports she has reopened at 1541 Piperberry Way. 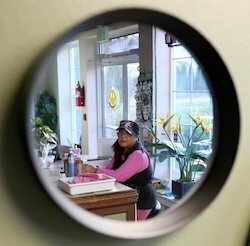 Kestle said she considered relocating to Silverdale but quickly realized how loyal her customers were to South Kitsap. Kestle can be reached at fabulookwa@yahoo.com. Tommy C’s, rebranded as Cash Brewing Company, is in a soft opening phase in Silverdale, according to the restaurant’s Facebook page.